Have you ever made a sand castle? What about a sand sculpture? At the North American Sand Sculpting Championship, sand sculpturing is an art form. The Virginia Beach Neptune Festival, which includes the Sand Sculpting Championship, was named after Neptune, the Roman god of the sea. You can go to this 10-day festival and participate in sporting competitions, arts and crafts, King Neptune's Grand Parade, and, of course, the sand competition. 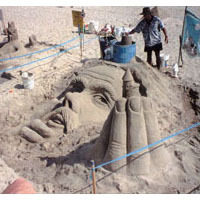 Both professionals and amateurs come to the Neptune Festival to compete in the sand sculpting competition. They start by using water to hold the sand together. Buckets, shovels, sprayers, wheelbarrows, ladders, and garden tools help make the sand sculptures. Cake cutters, pallet knives, spoons, and even melon-ballers are also used. Natural seashore items such as shells and seaweed are used for decorations. When the sculpture is finished you should take a photo of your masterpiece because, before you know it, it will all be washed away.